In the fifth post in this series, I will describe my experience taking Acquia's Certified Front End Specialist Exam for Drupal 8. I'll tell you what to study if you plan on taking this test, and who I think this test is best suited for. In the fourth post in this series, I will describe my experience taking Acquia's Certified Back End Specialist Exam for Drupal 8. I'll tell you what to study if you plan on taking this test, and who I think this test is best suited for. In the third post in this series, I will describe my experience taking Acquia's Certified Developer Exam for Drupal 8. I'll tell you what to study if you plan on taking this test, and who I think this test is best suited for. In the second post in this series, I will describe my experience taking Acquia's Certified Site Builder Exam for Drupal 8. I'll tell you what to study if you plan on taking this test, and who I think this test is best suited for. In this series of posts, I will describe my experience taking four Drupal 8 core certification exams in four days at DrupalCon Baltimore. This series will cover Acquia's Certified Site Builder, Certified Drupal Developer, Certified Back End Specialist, and Certified Front End Specialist exams. I will also explore who these exams would be valuable for, and how you should prepare for them. You will need to install Greasemonkey to make this work. 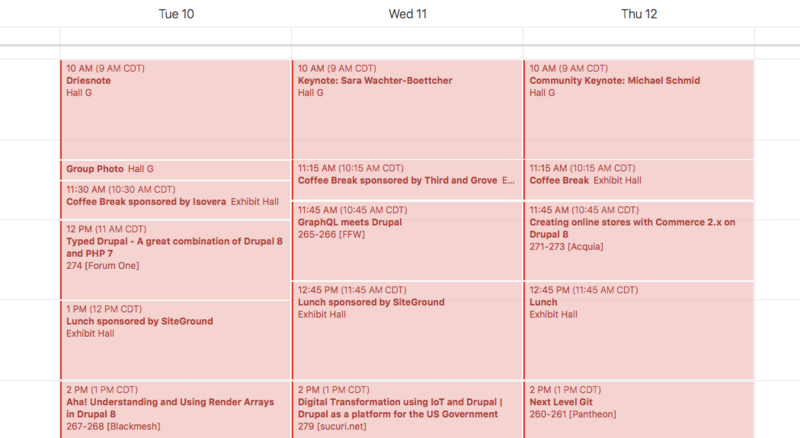 Once you add the script to GreaseMonkey, an [iCal] link will show up on DrupalCon session pages right next to the date and time of the session. Click the link to add the session to your calendar. Unfortunately, you still have to do them one at a time, but it's much faster than typing them in. If you've recently installed Drupal 8, you probably noticed that immediately after you complete the install, you get an error message on the Status Report page about the "Trusted Host Settings". This error message is tricky for most users to remove, since it requires editing the settings.php file (which is read-only), and adding some custom regular expressions to it to match the domain your site is running on. That seems to me like it's impossibly hard for many users to do, so I'm hoping that this process will soon change. In the meantime, I've posted a video with step-by-step instructions for setting up the Trusted Host Settings on a cPanel hosting account. A review of interesting Drupal tutorials posted this week: November 4 - 11, 2015. Highlights this week: an end of life announcement for Drupal 6, and tutorials on using configuration management in Drupal 8, tips for effectively using the Drupal Migrate module, and using Docker for Drupal Development. Gives you vertical tabs on the Views admin page, separating Views by their tags. Allows for speedier page loads for authenticated users. First you send the fast, cached parts of the page, then fill in the expensive parts when they are ready.